The veggie patch is now looking much more professional. The new wooden posts arrived a few days ago and Ed put them in with the help of Mr C and his digger. Mr C is also an expert on leeks – and apparently ours weren’t deep enough – so Ed replanted them. 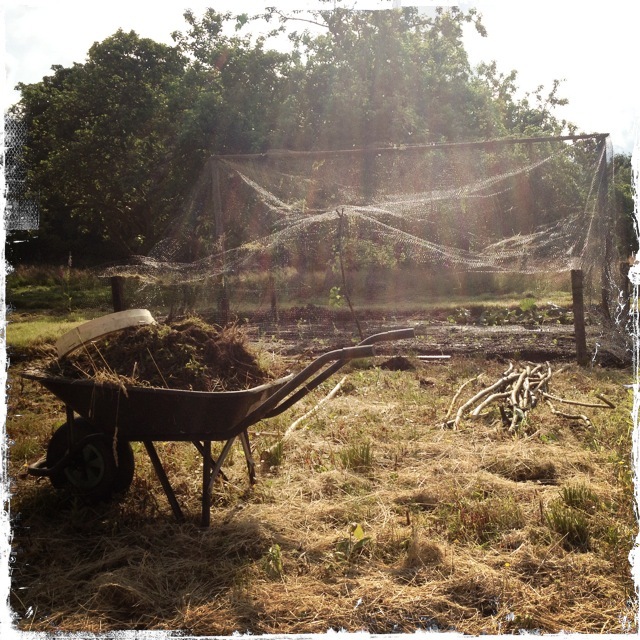 Ed ordered a huge piece of net to cover the whole thing which will keep out the birds. The carrots (in the front) have a finer net over them to stop carrot root fly – put together by our friend Dan who came up from London last weekend. Clearly we need all the help we can get! Categories: acres, castle, country house, countryside, gardens, moving, scotland | Tags: carrot root fly, leeks, vegetable patch, walled garden | Permalink. 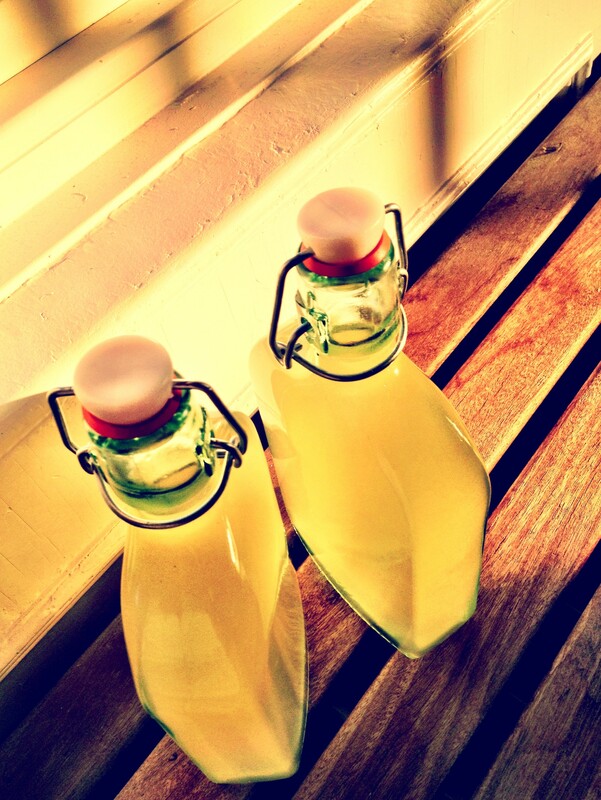 Categories: castle, country house, countryside, gardens, moving, scotland | Tags: cordial, elder, elderflower | Permalink. Ed’s concerned about the paddock. The docks, nettles and brambles (a recent discovery) are all really hard to get rid of once they take hold and are turning the paddock into impenetrable bush. If we don’t cut them back our plan for a wild flower meadow will never come to anything. We’ve been discussing getting a couple of goats (Ed had them when he was growing up) or finding someone with a shetland pony (we’ve seen some in a field near here and I’ve been asking around) but we still haven’t managed to sort anything out. So in desperation Ed started on it this morning with the strimmer. It was looking like an extremely long day – the paddock is 2 acres – when Mr C turned up like a knight in a shining tractor. It took him, his tractor and his mower less than an hour to do the whole lot. We owe him dinner. Categories: acres, castle, country house, countryside, gardens, moving, scotland | Tags: meadow, mow, paddock, strimmer, wild flowers | Permalink. 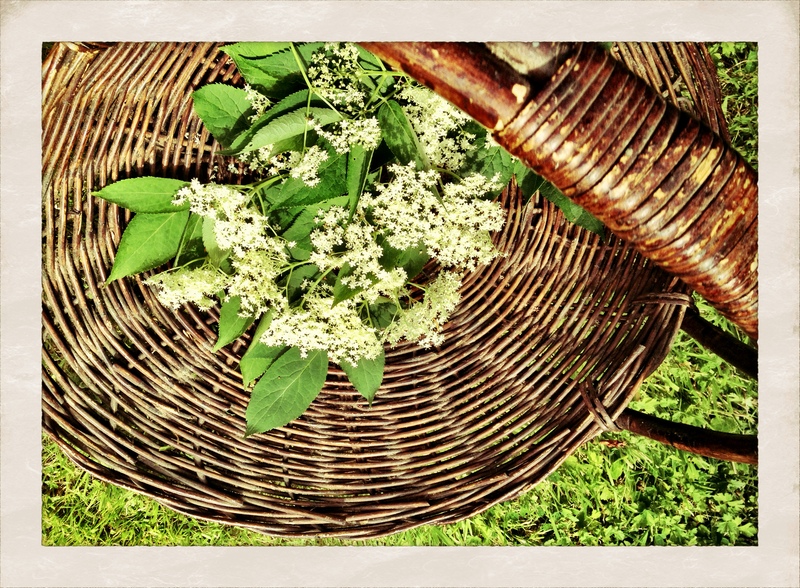 Categories: acres, castle, country house, countryside, gardens, moving, scotland | Tags: cordial, elder, elderflower | Permalink. We have a mishmash of radiators here and as part of our heating overhaul we’ve worked out that some of them (all the ones from the 50’s) have either no impact because they’re not big enough or they’re rusty and leaking. We need to replace just over a dozen. 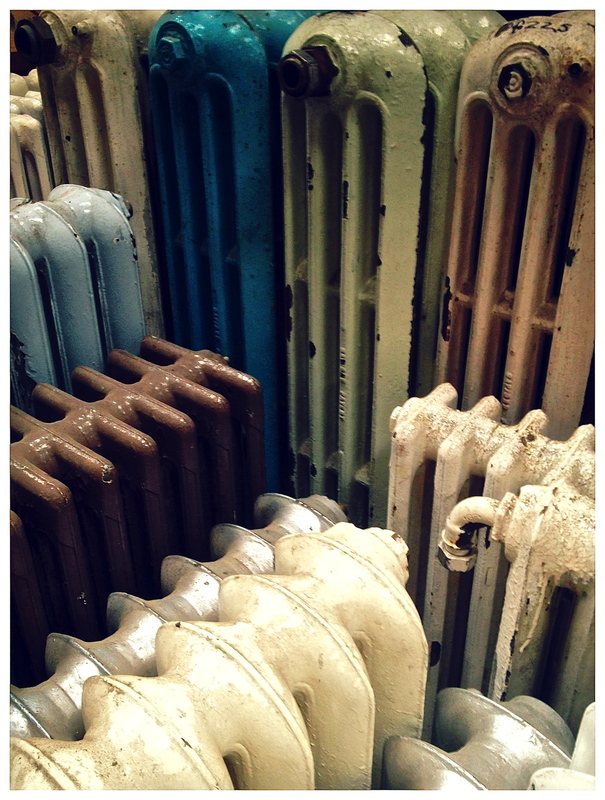 However the handful of Victorian cast iron ‘column’ radiators we have, work well and look lovely. So our plan is to get more – as cheaply as possible. Working out what sizes we need has involved a mind-blowing set of sums; I’ve had to work out the heat output (in kilowatts) we need in each room based on the room’s dimensions. I’ve then had to deduct the heat supplied by any existing radiators to establish what’s missing. All my kilowatt figures then have to be converted to old fashioned BTU’s – as this how the heat output is measured in old cast iron radiators. Once I know what heat output I need I then have to find the right size of radiator with the right dimensions so that it will fit into the space (often under a window). At this point my eyes are squinting as there’s a number of options depending on how the columns in each radiator are arranged – from tall and thin to short and fat…Much like the 2 different plumbers who reneged on doing the calculations for me. It’s all going to be worth it though as I’ve worked out that reconditioned salvage is going to cost us at least half the price of new (a whole other set of calculations) – and hunting around for them is obviously much more fun. So I’ve been scouring ebay, gumtree and the local flea markets and I even found a farmer nearby who sells stuff that’s been thrown out of old farmhouses. I’ve found 4 on our list this way. But the most obvious place is salvage yards and as there are two near here we headed over today with my copious notes in hand. Surely this can’t all go to plan…. Categories: castle, country house, moving, renovation, scotland, Uncategorized | Tags: cast iron, column radiator, heating, salvage, victorian radiator | Permalink. 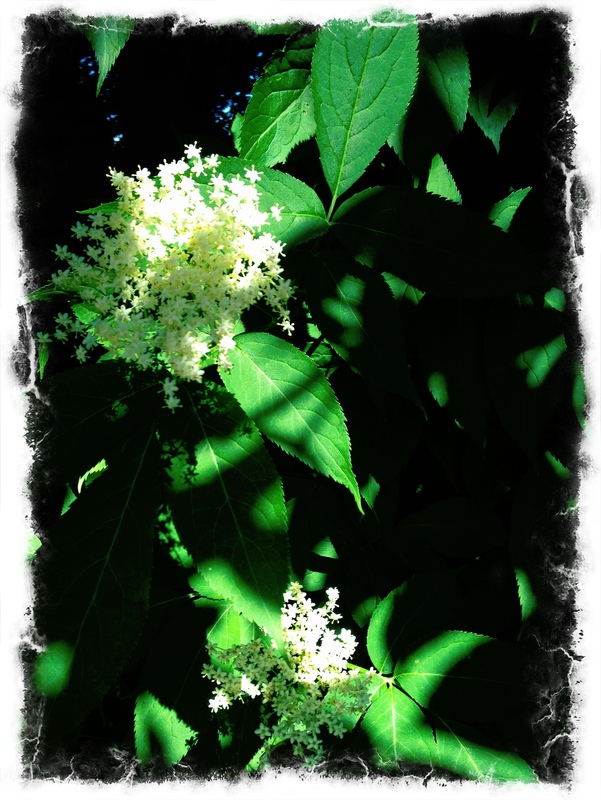 The early mornings are so lovely here at the moment, Gracie and I go out in the garden when the day starts. We don our wellies and I sit in my dressing gown drinking tea on the garden bench while Gracie runs around naked (aside from wellies) in the morning dew. 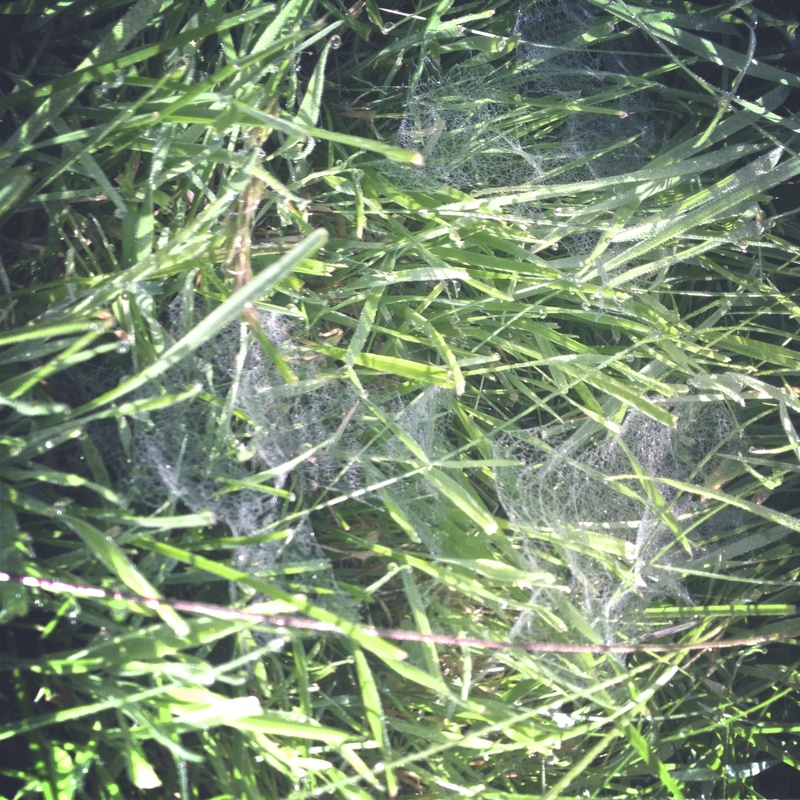 Today the lawns are covered in these tiny cobwebs…. Categories: castle, country house, countryside, gardens, moving, scotland | Tags: dew, spider webs | Permalink. 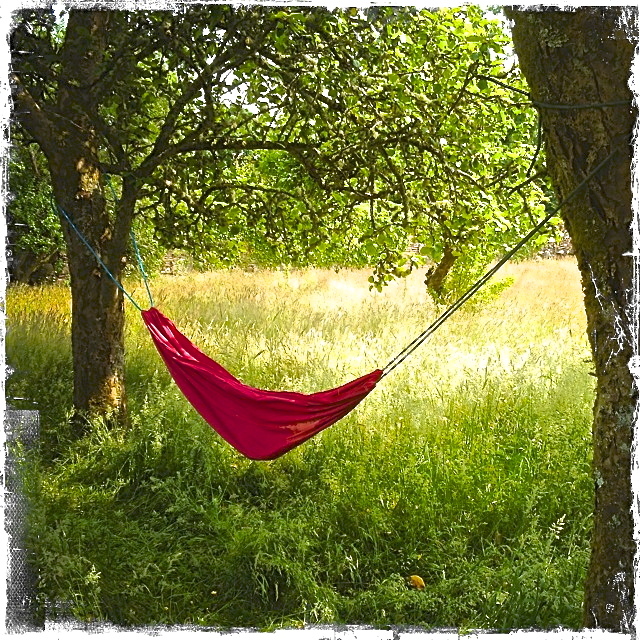 Categories: acres, castle, country house, countryside, gardens, moving, scotland | Tags: hammock, walled garden | Permalink.